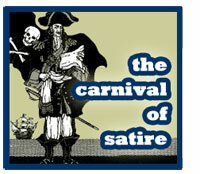 Ahoy mateys, and welcome to yer Carnival of Satire, the pirate edition. We be stretching Talk Like a Pirate Day into a whole week, and begad, we may just make it a month. Timothy Burke’s blog be called Easily Distracted, but only a focused bucko could imagine the brilliant Secret of My Success. When it comes to poetry, we pirates like it doggerel style, and Madeleine Begun Kane has an Ode To The Segway Scooter that tickled our fancy, just fine, thankee. Avast ye scurvy dogs! This fine piece of writing by Elizabeth at Creatures of the Earth was beyond our ken, but then, we’re barely literate pirates! The rest of you will no doubt enjoy, Google mon amour. Tommy at The Kag Report brings a grand invention to light —BeerAlert: For Your Emergency Beer Needs— now, we be wonderin’ do they plan GrogAlert next? This here post from Bile, Snark, and Sneer (sounds like the name of yer pirate law firm, don’t it) Sandy “the socks” strikes again, made us wonder if the archivist mentioned also had a proctology background. Arrr! Damian G. at Conservathink be reportin’ that Moslems demand Papal apology; some history “too important to be reported,” leading imams warn..
Michelle has 10 Easy Ways to Not Get Dumped. As pirates, we not be carin’ a hiccup in a hurricane fer self-improovi-ment, nor fer “relationships” other than the one with our cutlasses. All we need to be happy is some occasional booty. Arrrr! And fer those of ye bilge rats thinkin’ of going to Pirate U, perhaps ye might lucky enough to have GayProf at Center of Gravitas explain to ye the meaning of most academic Q&As. Thankee to that fine buccaneer, Ahistoricality for showin’ us this treasure. That brings us to the poop deck of this here carnival, mateys. We be seein’ ye (with our good eye) next week. The weekly schedule is back (and the 4 pm deadline). Submit via this handy form; the COS is listed at the Ubercarnival, and at the Blog Carnival too. Previous Post Thank ye mateys! Don’t make me keelhaul you, scallywags! Easily Distracted ain’t by Jonathan Dresner, bless ‘im, it’s me very own blog. A fine job, as always. Thanks for including me! Sorry ’bout that Cap’n Burke! And you’re welcome Mad — thanks for the regular diet of funny poetry! m.
Avast! I should have written something about Puss in Boots–a trickster, if not exactly a pirate. But at least i referred Creatures of the Earth to you. In writing. By certified mail.